May 2014 - Touch Display Research, Inc.
Today Qeexo announced it raised $2.3 million series A funding, led by Sierra Ventures. Last week I had a chance to meet Qeexo’s CEO Mr. Sang Won Lee, and their head of business development, Mr. Jason Liang and got to know this start-up company. Qeexo is pronounced as “Kick, So”. It was founded in September 2012. Mr. Lee demonstrated their software, named “FingerSense” to me on a Samsung smartphone. See figure here. 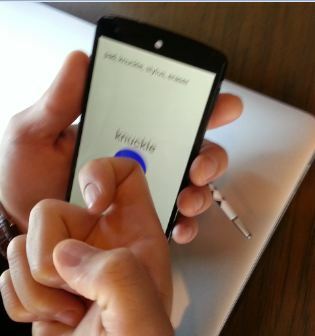 With this software add on a typical smart phone, the touch screen could tell if it’s a finger touch, or knuckle touch, or a stylus touch. Qeexo indicated the FingerSense is software only, and can be deployed on today’s mobile devices without adding any hardware. Mr. Lee indicated the touch industry has come from single touch to multi-touch, the next wave will be “rich touch”. 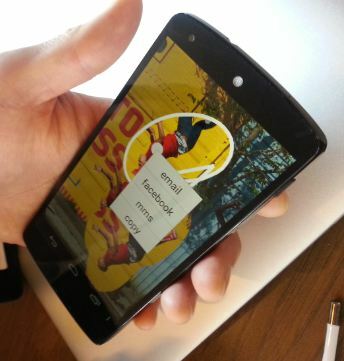 Qeexo is currently in discussions with a number of mobile device manufacturers to embed FingerSense into their devices or license the software. More analysis will be in our “Touch and Emerging Display” report. You can subscribe to the report right now on this website. This entry was posted in Company News, Touch screens and tagged finger touch, FingerSense, funding, knuckle touch, Qeexo, Sierra Ventures, software, stylus touch, Touch screen on May 29, 2014 by jennycolegrove. Today Microsoft announced their new tablet PC: Surface Pro 3. It’s an improvement version over the Surface Pro 2. Although both tablets are with active pen, Surface Pro 3 is 32% thinner at only 0.36 inch, while the Surface Pro 2 is 0.53 inch thick. How does Microsoft Surface group achieve the thinness? The answer is in the touch and active pen technology. Simultaneous finger touch and pen writing are the ideal human machine interface. Active pen technology is superior to passive pen in terms of accuracy, pressure sensing, and input of fine line. In our recently released Active pen technologies supply chain and market forecast 2014 report, we forecast that active pen usage will have rapid growth in the next several years. Touch Display Research’s “Active pen 2014 report” provides analysis of over a dozen digital pen technologies: nine active pen technologies and six passive pen technologies. All the Android and Windows devices with active pen are compared side by side in a single chart. The attitude of leading brands toward active pen is analyzed. This includes Samsung, Sony, Intel, HP, Dell, Microsoft, Qualcomm, and Apple. You can subscribe to the report right now on our website. 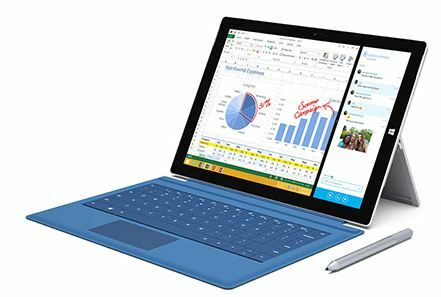 This entry was posted in Active Pen, Displays, Touch screens and tagged active pen, Active pen report, Apple, Dell, HP, Intel, Microsoft, Microsoft Surface 2, Microsoft Surface 3, Qualcomm, Samsung, sony, thin, touch and pen, touch technology on May 20, 2014 by jennycolegrove. I’m traveling in northern Ohio this week to speak at the FlexTech Alliance workshop. It’s good to be back in Ohio, since I got my Ph.D. from Kent State University in Ohio 14 years ago. Ohio is like my second home. Kent Displays invited me to visit them during this trip. 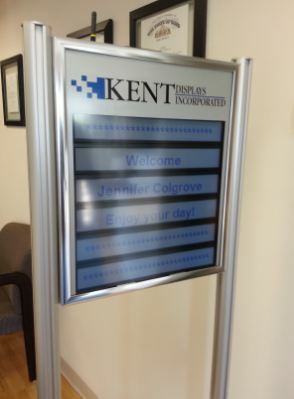 Right when I entered Kent Displays’ company lobby, there is a digital signage in the lobby, showing the message, “Welcome, Jennifer Colegrove, Enjoy your day.” I felt very special and took a picture of it. See figure here. The digital signage is using Kent Displays’ bi-stable LCD, which is called “zero power” display. The display doesn’t consume any power when showing a static image; only consume power when you change the image. It is operated with battery; no power plug needed. I had a meeting with my old industry friends: Dr. Green, CEO of Kent Displays, and Dr. Khan, CTO of Kent Displays, and Mr. Oswald, communication director of Kent Displays. I also had a tour of their factory and discovered their success story of the Boogie Board. Kent Displays make the Boogie Board from the flexible display to the final shipping box of the Boogie Board. In another words, they do the whole supply chain. Dr. Khan said, “In some sense, we are doing more than Apple.” That is a good comparison and its true. Apple doesn’t make the displays; rather they purchase the displays from LG, Samsung, Sharp, AUO, Japan Display, etc. More analysis will be in our “Touch and Emerging Display” May 2014 report. You can subscribe to the report right now on this website. This entry was posted in bi-stable display, Flexible curved display, travel and tagged Apple, bi-stable display, Boogie Board, Digital Signage, FlexTech Alliance, Kent Displays, Ohio, success story, supply chain on May 15, 2014 by jennycolegrove.